Joe Harris who will be the "1" for the solo start for the Bermuda 1-2 race on June 9th from Newport Rhode Island announced today that Dobbs Davis from Annapolis Maryland will be the "2" for the double-handed return trip starting June 22nd from St George's Bermuda. "I'm excited to be sailing with someone of Dobbs Davis' caliber for the double-handed leg of this event," said Harris from Gryphon Solo at the Newport Shipyard. "This will be a new experience for Dobbs. He has never sailed an Open 50, but with his experience in many types of boats and all types of sailing conditions, he'll get the hang of it quickly." "Dobbs will come over to Bermuda several days before the race starts. He and I will sail around the island a couple of times over two days and maybe some at night, too. We'll practice our procedures for tacks, jibes, spinnaker sets and douses, sail changes and reefing." "I love solo sailing, but sailing with a quality sailor like Dobbs is great," Harris concluded. "And on the lighter side, it is good to have someone to hand you up a cup of hot coffee or soup in the middle of the midnight watch on a lumpy, wet Gulf Stream night." Davis who was equally enthusiastic about sailing the double-handed race on Gryphon Solo said, "I'm excited to have the opportunity to sail with Joe in this race. The Open 50 design has always intrigued me, so I look forward to learning more about how the two of us can optimize Gryphon Solo's performance." Since 1996, Davis has been a professional sailor and writer. He is active in local Annapolis sailing and in national, and international-level inshore and offshore racing and match race sailing. His recent focus has been on coaching, educating, rules management and umpiring. In his other life, Dobbs is a sailing journalist and his column on US racing and sailing news appears regularly in Seahorse Magazine. He is a North U lecturer and program developer. If anyone is interested in coming to Newport to watch the start of the Bermuda 1-2 on Saturday, please stop by to see Joe and Gryphon solo at Newport Shipyard in the morning and then head for Ft. Adams or Castle Hill to watch the fleet of solo sailors sail by. Then follow Joe's race reports on http://www.gryphonsolo.com/page. The 2007 Bermuda 1-2 is organized by Goat Island Yacht Club, Ltd. and Newport (RI) Yacht Club, with support from the Rhode Island State Yachting Committee, the City of Newport, RI and the Town of St. George's, Bermuda. St. George's Dinghy & Sports Club is the host club in Bermuda. Joe, as skipper and owner of Gryphon Solo, is in full pursuit of his round-the-world campaign and this is the first of three events this season as he trains for the Portimao Global Ocean Race ("PGOR") now scheduled to start from Portimao, Portugal in September 2008. The race start was pushed back a year and the name changed to accommodate the new title sponsor and host port of Portimao. The race course remains the same, with stops in South Africa, New Zealand, Brazil and South Carolina before returning to Portugal. 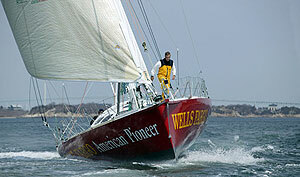 The big red Open 50 will also sail in the Bermuda 1-2 and the Marblehead to Halifax Race this summer. "I'm sailing over 3,000 miles to and from Bermuda this summer," Harris quipped, "and based on my experience, no two passages will be the same. The Gulf Stream and the Atlantic are full of surprises. Then I'm off again on July 9th from Marblehead to Halifax Nova Scotia, sailing in colder water, the powerful tides found in the Bay of Fundy and equally tricky currents around Halifax. I'm looking forward to another summer of great offshore racing. "Going to Charleston for the C2B was important for me this year," Harris commented. "Charleston will be the last stop before the finish in the 2008-09 PGOR, with the race visiting the South Carolina in the spring of 2009. Gryphon Solo is supported by sponsorship from Iridium, Doyle Sailmakers, Awlgrip/Interlux, New England Rope and Alpine Air Food and is actively seeking title sponsorship and partners in this amazing race. The full story of Joe Harris' campaign and sponsorship opportunities for the Portimao Global Ocean Race is at www.gryphonsolo.com . Joe Harris' big red Open 50 is built entirely of lightweight carbon fiber and uses a hydraulically operated canting keel for added stability. The boat has twin daggerboards and twin rudders to provide added "lift" to windward. The combination of massive sail area, stability and light construction gives the boat tremendous power and acceleration. Gryphon Solo is a modern racing machine, capable of speeds in excess of 20 knots while remaining stable and under control. The yacht carries the latest high-tech electronics and communications equipment, allowing the skipper to not only sail competitively, but also to stay in touch with sailors, sponsors and the media from anywhere on earth. Future plans for Joe and his Open 50 include the 2008 Newport Bermuda Race, and the 2008/09 Portimao Global Ocean Race (www.portimaoglobaloceanrace.com) a solo, 'round the world race starting in Portimao, Portugal with stops in South Africa, New Zealand, Brazil, Charleston South Carolina and the finishing back in Portimao. The Gryphon Solo Global Ocean Classroom will be a unique opportunity to reach young children with the great story of this adventure and the waters round the world. The Global Ocean Classroom curriculum will be available to schools and individual students and their parents for the September to June 2008-09 academic year, and will follow Harris and a courageous fleet of solo sailors as they battle the elements, their competitors and themselves over 30,000 miles of open ocean. Joe and Team GS are actively seeking sponsorship for this sailing adventure, complemented by a branded education program as well as a post-race speaking and promotional tour. For information about Joe Harris and the Gryphon Solo program and sponsorship opportunities go to www.gryphonsolo.com.